This season’s play is Romeo and Juliet, directed by Kate Mendeloff of the U-M Residential College, Carol Gray, and Graham Atkin and performed by U-M students and community players. Performance dates Thurs.-Sun., June 7-10; 14-17; 21-24. Members: Matthaei-Nichols members may reserve tickets in advance. This option lets you reserve tickets and pay for them the evening of the performance. 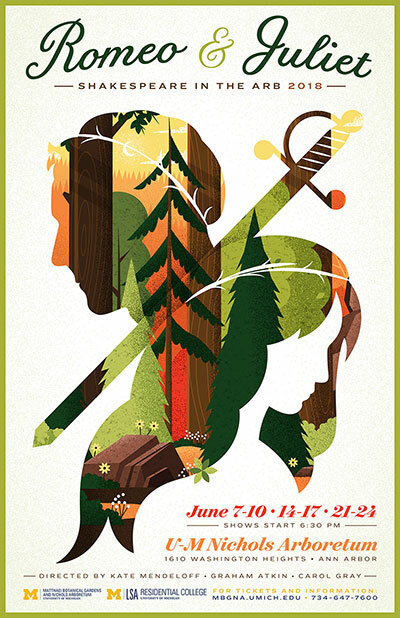 Tickets for Shakespeare in the Arb are sold day of show only and on a first-come, first-served basis. Please arrive early to assure seating: due to the mobile nature of the performances and the outdoor settings, a limited number of tickets are available for each show. Box Office opens at 5:30 pm for general admission; Matthaei-Nichols members receive a discount on tickets and may reserve tickets in advance. Not a member? Join and save on Shakespeare tickets and more. Reserved member tickets will be released at 6 PM if not picked up by that time. The Box office will close at 6:15 PM before every performance, please plan accordingly. Shows start at 6:30. Ticket prices: Matthaei-Nichols members: $15; students with ID: $10; adults 19 and over: $20; seniors 62 and over: $17; children and youth 5-17: $10; 5 and under free. Parking: Free parking is available in U-M lots M-28 and M-29 near the 1610 Washington Hts. entrance to the Arb, and paid parking is available in the U-M Hospital P2 structure. Support for Shakespeare in the Arb provided by Michigan Council for Arts and Cultural Affairs and The Arts Alliance.